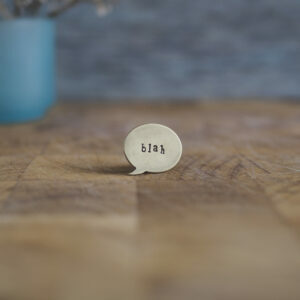 With my new little speech bubble pins you can get your message across simply and succinctly. Who doesn’t feel a little ‘blah‘ at times. Maybe you’re not particularly excited about your day or your tasks ahead, or maybe you’re just a bit tired, lethargic and fed up. Express yourself with one of my little ‘blah‘ pins neatly pinned to your jacket or jumper and then you don’t even have to speak. Your expression, body language will say it all and be amplified if you just point in the direction of your pin when someone asks you how you’re feeling. Perfect as a treat for yourself, or a gift for someone special in your life, or maybe a co-worker or friend. Each pin is individually stamped with the word ‘blah’ and handcut from recycled brass industry offcuts and finished off with a sturdy brass pin and rubber pin back. Each pin is totally unique and you can choose whether you would like the speech bubble to be left or right facing.